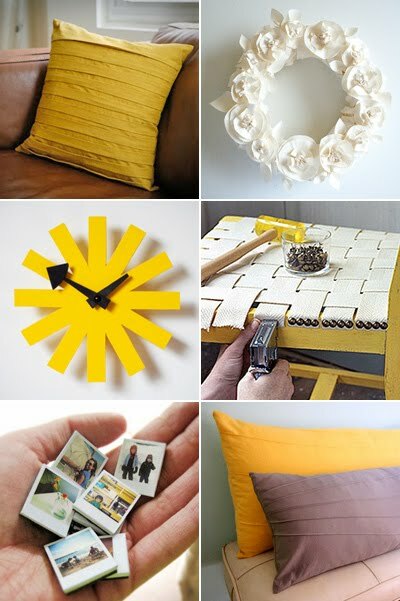 Links to instructions for making these lovely items are below. Go nuts! Tiny polaroid magnets from Ambrosia Girl, inspired by my Pantone magnets! This is the best DIY roundup I've seen anywhere in a long, long time. Thank you! that butcher paper wreath is gorgeous!! Been gathering the materials for the magnets. Just waiting for an art director friend to give me some pantone chips. This is a gift for her, she is such a good friend. Can't wait to see how they come out. May have to try the polaroid magnets for my fridge. I need some new images up there. Thanks for such great ideas and a beautiful site. yippy! lovely round up. (and a thank you for including me). I love those tiny polaroid magnets - so cool! Thanks for this lovely round-up. Not only have I discovered how to make some lovely new things but also discovered some great new blogs! I just LOVE your blog!!! You always have the most amazing tutorials!! I love these. I am glad that I have a free weekend so that I can make all of these! Thank you so much for this fabulous roundup! What a great gathering of inspiration! Thanks so much for including my wreath!! thank you so much for highlighting my pleated pillow! i love your blog and look at it daily. Great ideas...love the butcher paper wreath! Oh I LOVE the Polaroid magnets, I just bought some thing to make them I'm so excited! They are on the top of my summer craft To-Do list!